From Kate Spade to Oscar de la Renta their runway trends never fail to encourage us to kick ourselves out of our comfort zones, and this year’s looks are no different. 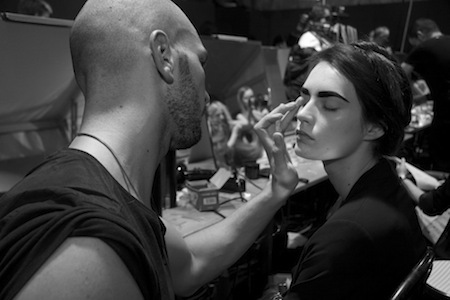 Gorgeous hair, fresh makeup and cool nail ideas, straight from the New York Spring 2015 runways. Here are a few of our favourites we thought we would share. Derek Lam quotes backstage, “I want the colour to be there but I don’t want it to be aggressive”. Firstly line your upper lashes with dark brown liner. Then dab a pinky/violet lipstick on your lids and brush with metallic brown eye shadow. Finish with a coat of dark purple mascara on your top lashes leaving under your eyes naked to create a key focal point. Why braid with three sections when you can braid with four. Donna Karen showed us how to rock a twist-braid ponytail. Split your ponytail into four sections. Cross section 2 over section 3, then cross section 1 behind 3, bring 2 over, cross 4 under the braid and cross section 1 over. Continue down your ponytail and finish with some high glass hairspray. Sophie Theallet has a distinct tropical theme running through her collection and her nails were no exception. To create the double french manicure simply apply a standard french manicure with a slightly larger white section than normal. Then draw a thin coloured line along the very tip of the nail. A much needed revival for the french manicure. Give these tips a try and let us know how you go!